A naval officer tells us what he remembers, including seeing a huge opening in the ice in a no-fly area they were crossing with a medical emergency on board. Then he ferried a group of scientists who had disappeared for two weeks, and has specifically been warned not to refer again to this subject. As he put it, “they looked scared. Antarctica has long been considered one of the most mysterious places on Earth. Therefore, it is not strange that numerous ‘conspiracy theories, claims, and accounts’ have been proposed throughout the years, trying to explain some of the many enigmatic occurrences on Earth’s most isolated continent. 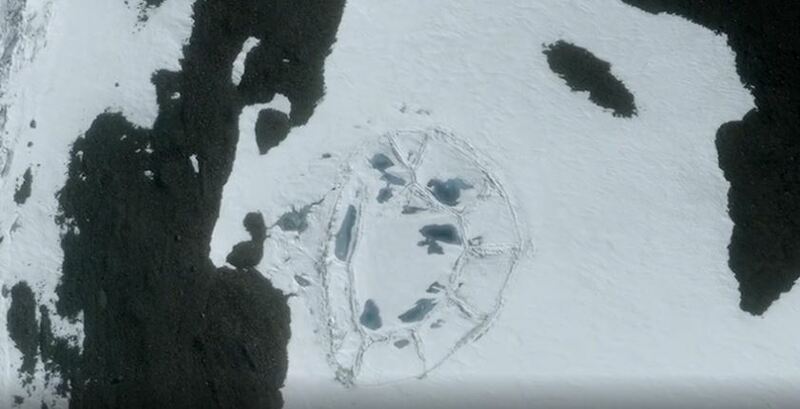 Talk about ancient civilization inhabiting Antarctica has existed for decades. What if, in the distant past, when Earth –and Antarctica— was much different than today, an ancient civilization developed there, creating fascinating structures, monuments and temples? Perhaps one of the greatest reasons is because it is so isolated and you can’t just travel there as you wish. Furthermore, even though we know about Antarctica only for a little over 100 years, there are numerous ancient maps that depict parts of Antarctica free of ice. One of the most controversial maps was without a doubt composed in 1513, by Turkish Admiral Piri Reis who drew a map that would create a global debate over 500 years after him. The map depicts Antarctica which was discovered between 1818-1820. But how is this possible? The history of Antarctica emerges from early Western theories of a vast continent, known as Terra Australis, believed to exist in the far south of the globe. The term Antarctic, referring to the opposite of the Arctic Circle, was coined by Marinus of Tyre in the 2nd century AD. In 1820, several expeditions claimed to have been the first to have sighted the ice shelf or the continent. Interestingly, a Russian expedition was led by Fabian Gottlieb von Bellingshausen and Mikhail Lazarev, a British expedition was captained by Edward Bransfield and an American sealer Nathaniel Palmer participated. The first landing was probably just over a year later when American Captain John Davis, a sealer, set foot on the ice. Norwegian Roald Amundsen finally reached the Pole on December 14, 1911, following a dramatic race with the Englishman Robert Falcon Scott. In 2012, a satellite image of Antarctica spotted a strange oval-shaped formation in one of the most remote places on the planet. Thousands of miles from modern society, the strange oval-shaped structure raised numerous questions among experts. What do you think? Is there anything strange to Antarctica? Is Antarctica just an isolated, frozen continent? Or is there perhaps more to it, as many conspiracy theorists and whistleblowers claim?